Today, Designing Hong Kong celebrates the re-opening of the crossing at Salisbury Road at Tsim Sha Tsui. This allows people to cross at grade from Nathan Road to the waterfront promenade and the Cultural Centre. In a survey in 2011, 77% of the respondents indicated they prefer a direct crossing at street level at Salisbury Road. The survey findings were presented as part of a walkability study to the Harbourfront Commission in July 2012. 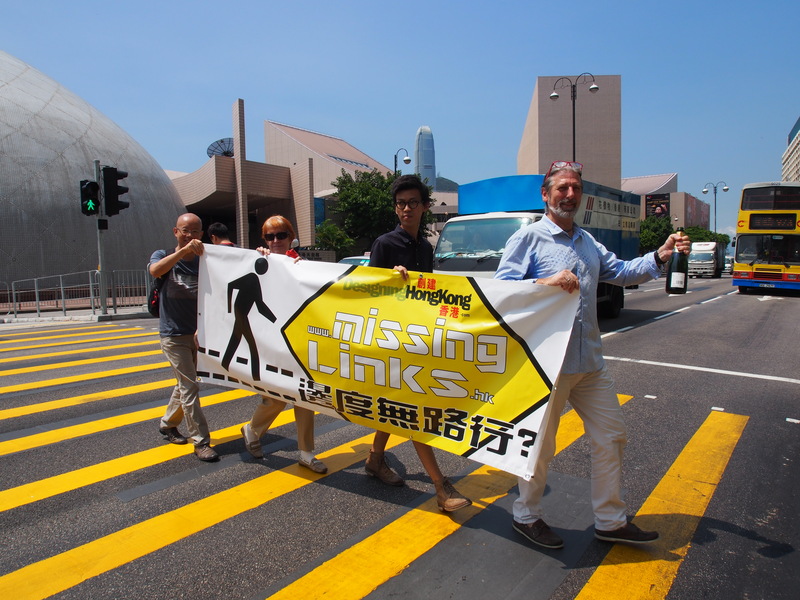 In 2013, Designing Hong Kong with the support from Community for Road Safety started a ‘Missing Links’ campaign. Over 159 reports of substandard and missing pavements and crossing have been reported by the public. The team has reviewed the complaints and submitted 128 reports for improving walkability to the government and district councils in July 2014. The Transport Department is actively studying all the reports. ‘We are all pedestrians. Together we can make Hong Kong, not just Tsim Sha Tsui, more pedestrian friendly and safe,’ concluded Paul Zimmerman. Please click here for a drawing of the crossing. 2004 - Crossing removed by Transport Department. 2005 - Harbour Business Forum wrote to the Secretary of Housing, Planning and Lands to request re-instatement of the at-grade crossing. February 2011 - Designing Hong Kong survey on walkability in Tsim Sha Tsui. 77% of over 600 people surveyed prefer a direct crossing at grade at Salisbury Road. July 2012 - Designing Hong Kong and Civic Exchange presented their views on walkability, including the missing crossing at Salisbury Road, to the Harbourfront Commission. September 2012 - The Democratic Alliance for the Betterment and Progress of Hong Kong (DAB) proposed an agenda item at Yau Tsim Mong District Council: ‘Request for Better Underground Passage Connection between Tsim Sha Tsui East and Hong Kong Cultural Centre’. March 2013 - Avenue of Stars Management Limited presented plans and consultancy study findings on crossing improvements and traffic impacts at the Yau Tsim Mong District Council. April 2013 - Video ‘Lost in TST’ released on Youtube, highlighting the issue of the lack of crossing. July 2013 - Transport Department circulated plan to restore crossing at Yau Tsim Mong District Council. Designing Hong Kong received 159 reports of Missing Links in Hong Kong over the last year. The team has reviewed the complaints and made suggestions with 128 reports for improving walkability submitted to the government. The Missing Links reports from the public included 31 narrow footpaths, 22 missing footpaths, 16 unsafe crossings, 37 missing crossings and 22 other problems which impacted Hong Kong’s walkability. We have submitted each report to the Transport Department and the District Councils. The government responded positively with proposed amendments for the problems. For example,a street level crossing is now being put back near the Peninsula Hotel across Salisbury Road. Of the Missing Links in the Eastern District, some can be fixed quickly and some will have to wait for slope stabilization, major road works, or redevelopment of adjacent sites before they can be taken forward. Designing Hong Kong promotes the Missing Links campaign with videos to draw people’s attention to the pedestrian walking environment. The latest video highlights the problem of an obvious missing crossing at Hong Ning Street in Kwun Tong, where many people cross the road illegally to avoid a long unnecessary detour around many railings. Designing Hong Kong suggests that the authority provides a formal crossing to let people cross the road safely. 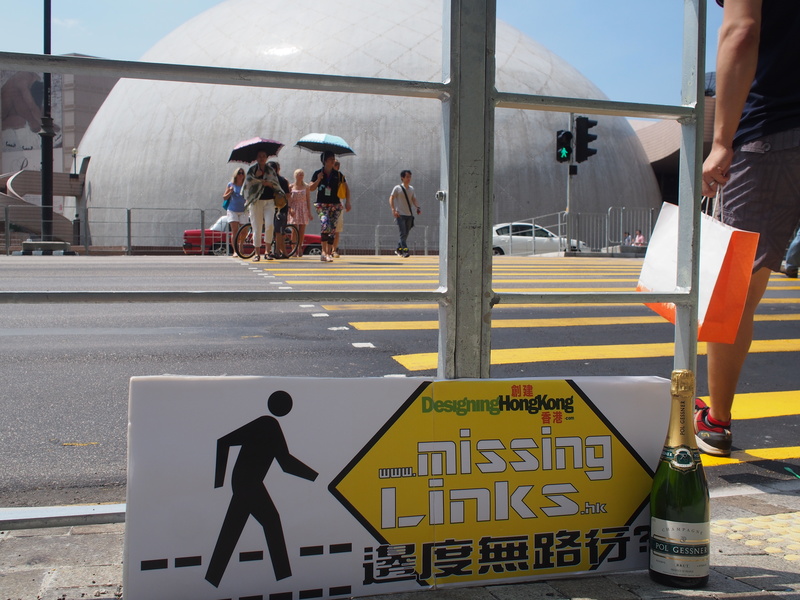 Designing Hong Kong has created the “Missing Links” campaign to gather information on pedestrian links which need to be fixed through crowd sourcing. People are invited to upload pictures of footpaths or crossings which need improvement at www.missinglinks.hk. Designing Hong Kong will inform the Transport Department and track their response on-line. In the latest video promoting ‘missinglinks.hk’ Paul Zimmerman had to jump and hang off a fence to save him from oncoming traffic. The “Lost in Deep Water Bay” video (http://youtu.be/MtI9OPiiZB8) highlights the problem of intermittent footpaths along Hong Kong’s roads. The first video, “Lost in Tsim Sha Tsui” (http://youtu.be/ThFiS_Nn0Q4) highlighted the problem of missing pedestrian crossings by comparing jaywalking across Salisbury Road with the tunnel route. “The priority has always been the vehicle. We need a greater focus on pedestrians. Despite spending $16 billion on fixing slopes since 1977, half of which were along roads, Government did not fix the footpaths at the same time. By creating a list on-line we hope to help re-balance the focus,” Paul Zimmerman explained. Designing Hong Kong has created the “Missing Links” campaign to gather information on pedestrian links which need to be fixed through crowd sourcing. People are invites to upload pictures of footpaths or crossings which need improvement at www.missinglinks.hk.